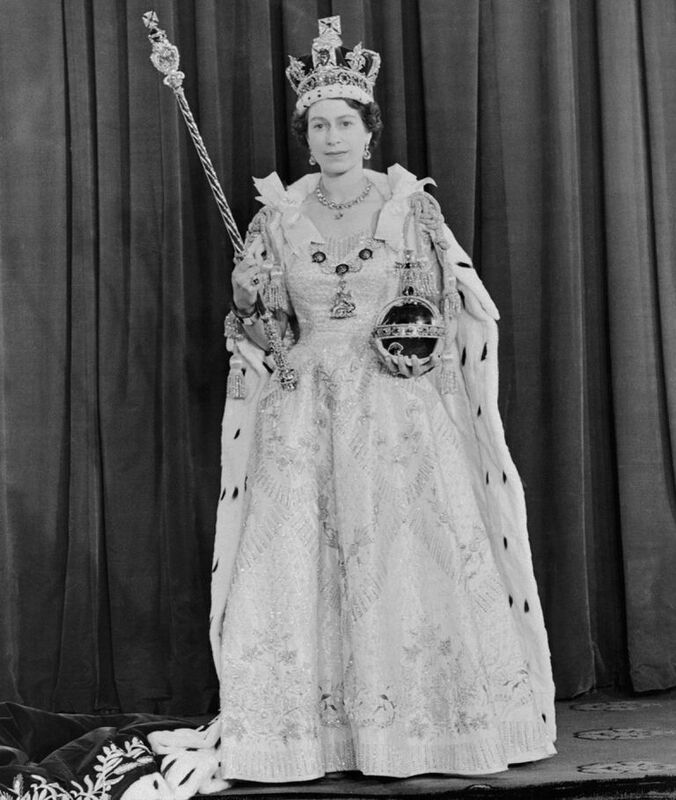 Queen Elizabeth II after her coronation. Princess Elizabeth (born Elizabeth Alexandra Mary on April 21, 1926) became Queen Elizabeth II in 1952 at the age of 25. Her father, King George VI suffered from lung cancer for much of his later life and died in his sleep on February 6, 1952, at age 56. Upon his death, Princess Elizabeth, his oldest daughter, became Queen of England. Princess Elizabeth and her husband, Prince Philip, were in East Africa when King George died. The couple had been visiting Kenya as part of the beginning of a planned five-month tour of Australia and New Zealand when they received the news of King George's death. With this very sad news, the couple immediately made plans to return to Great Britain. While Elizabeth was still flying home, England's Accession Council met to officially determine who was the heir to the throne. By 7 p.m. it was announced that the new monarch would be Queen Elizabeth II. When Elizabeth arrived in London, she was met at the airport by Prime Minister Winston Churchill to begin preparation for the viewing and burial of her father. After laying in state at Westminster Hall for over 300,000 people to pay respect to his image, King George VI was buried on February 15, 1952, at St. George's Chapel in Windsor, England. The funeral procession involved the entire royal court and 56 chimes from Big Ben, one for each year of the king's life. Over a year after her father's death, Queen Elizabeth II's coronation was held at Westminster Abbey on June 2, 1953. It was the first televised coronation in history (yet excluded the communion and anointing). Before the coronation, Elizabeth II and Phillip, Duke of Edinburgh, moved into Buckingham Palace in preparation for her reign. Although it was highly believed that the royal house would assume Philip's name, becoming the House of Mountbatten, Elizabeth II's grandmother, Queen Mary, and Prime Minister Churchill favored retaining the House of Windsor. Ultimately, Queen Elizabeth II released a proclamation on April 9, 1952, a full year before the coronation, that the royal house would remain as Windsor. However, after the death of Queen Mary in March of 1953, the name Mountbatten-Windsor was adopted for male-line descendants of the couple. Despite Queen Mary's untimely death three months prior, the coronation in June continued as planned, as the former queen had requested before her death. The coronation gown worn by Queen Elizabeth II was embroidered with the floral symbols of Commonwealth countries including the English Tudor rose, Welsh leek, Irish shamrock, Scots thistle, Australian wattle, New Zealand silver fern, South African protea, Indan and Ceylon lotus, Pakistani wheat, cotton, and jute and the Canadian maple leaf. As of February 2017, Queen Elizabeth II is still the reigning queen of England at 90 years old. The current royal family consists of her offspring with Philip. Their son Charles, Prince of Wales, married his first wife Diana, who bore their sons Prince Henry (of Wales) and William (Duke of Cambridge), who in turn married Kate (Duchess of Cambridge), who bore Prince George and Princesses Charlotte (of Cambridge). Prince Charles married Camilla (Duchess of Cornwall) in 2005. Elizabeths' daughter Princess Royal Anne married Captain Mark Phillips and bore Peter Phillips and Zara Tindall, both of which married and had children (Peter fathered Savannah and Isla with wife Autumn Phillips and Zara mothered Mia Grace with husband Mike Tendall). Queen Elizabeth II's son Andrew (Duke of York) married Sarah (Duchess of York) and sired Princesses Beatrice and Eugenia of York. The queen's youngest son, Edward (Earl of Wessex) married Sophie (Countess of Wessex) who gave birth to Lady Louise Windsor and Viscount Severn James.